If you are planning a journey to Portugal make sure you don’t miss its capital city, Lisbon with its many panoramic points offering spectacular views over the city and the Tagus River. 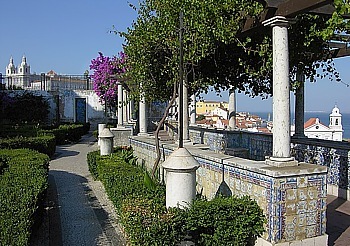 The best views are from the Alfama area, in particular from Miradouro de Santa Luzia, a pergola covered terrace with fantastic azulejos covering the external wall of the Santa Luzia church; further up are the miradouros of Senhora do Monte and da Graça. The miradouro of Santa Catarina in the Bica quarter, down from Bairro Alto, offers breathtaking views over the river and the 25 de Abril Bridge. Other panoramic points are the San Jorge Castle and the top of the Cristo Rei, a 90 foot statue of Jesus with the arms stretched out that was erected during the late 1940s’ to thank God for sparing Lisbon from World War II. The Lisbon Festivities, celebrations of Popular Saints in Lisbon from the 12the to the 30th of June that include street decorations, paper lanterns and parades in each district with live music and dancing. In the evening people party on the streets of the Alfama district where sardines are grilled outside the houses. The Bom Jesus Baroque steps, 6 km away from Braga in the North of Portugal, dotted with chapels, fountains and statues, which symbolize the Fourteen Stations of the Cross are an impressive site. The steps take up to the church set on top of the hill surrounded by gardens dating back to 15th century. In Porto walk around the old city centre and admire the cold architecture dominated by marble and iron. 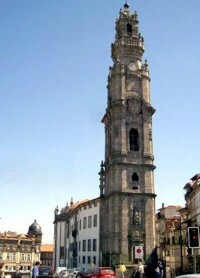 The Torre dos Clerigos (Tower of Clerics), which is a prominent monument and the symbol of Porto, dates back to the 18th century; the 75.6m high tower has 225 steps that can be climbed to enjoy the views over the river and Vila Nova de Gaia. Still in Porto the wine lovers must go across the Douro River to Vila Nova de Gaia to discover the secrets of Port wine. There are 58 wine companies spread out between the river bank and the hill and they are open to visitors for tours of the cellars and wine tasting. Some of the better known names are Taylor’s, Sandeman and Ferreira. The home of port wine, the Douro Valley is spectacular with the hills covered with terraces of vines falling steeply down to the river banks. The Douro River originates in Spain and flows west in the north of Portugal until it reaches the ocean in Porto. The valley can be visited by car, there is a road along the river between Peso da Regua and Pinhao, but the best scenery is from the hills driving up the winding roads. A better way to visit the area is either by train or by cruising up the river with one of the many boat rides on offer.